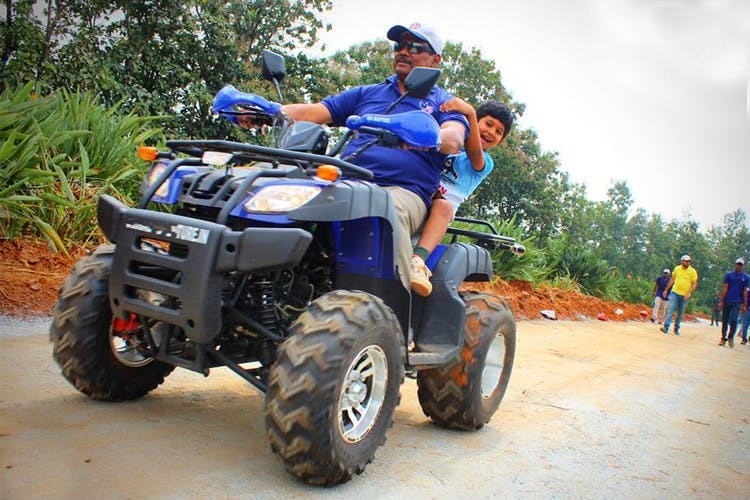 Rev it up on an ATV or go on a shooting spree at the paintball area at Eagles Unbound; channelling your inner adrenaline junkie is the only way to have maximum fun. In the distant land of Kanakapura, there’s an adventure arena where you will ditch the comforts of the WiFi for the thrill of the wild. Eagles Unbound is all about embracing your inner wild child and letting loose with their adrenaline pumping activities. And what’s more perfect than gearing up and hitting an outdoor track on a massive, all-terrain vehicle (ATV), right? Get your speed thrills and adrenaline rush sorted on them monster machines. Once you’ve got your adrenaline rush and speed thrills sorted, hit up the outdoor paintball zone for a high-octane game of Capture The Flag or The Last One Standing. Nothing like unleashing hell and your expert marksmanship on the battlefield like a spirited game of paintball. Call us maybe for a round or two? We are excellent markers we are told! The entire field can be booked out for hours on end, in case you are one of those people for whom a 15-minute game is like a warm-up. The arena is filled with activities that almost anyone and everyone can take up. In case you are coming with your fam and have kids in the group, there’s wall climbing, low rope courses, and zorbing to try out. While the little ones have a field day, the adults can take to activities such as zip-lining and rappelling. Zip lining is fun folks and if you haven’t tried it before, you should for the thrill of it. But that’s not all, there are all kinds of targeting shooting activities such as archery and shooting for you to turn into Robin Hood or Deadshot. There’s that infamous bull stimulator too where you need to hold on to your bull and not get thrown away! Probably make a challenge out of it with your friends and see who lasts longer! The place is fun and it’s perfect for those weekend outings with the squad or fam. Carry a picnic basket if you must to make it a fun day!